I tend to play games at a odd pace. The combination of an extremely busy year and my tendency to "chew my food" means that there are times when I either don't play anything or choose to obsess over a single game. Because of this, the "what we are playing" sidebar is probably the most neglected area of the site. Without Jorge to remind me (or simply update the thing for me), things start to look pretty stagnant. However, looks can be deceiving: I've recently started a handful of new games. Actually, "new to me," might be a more accurate way of putting it; all of my recent interests are from years past. Regardless of release date, jumping into a new experience still elicits a similar kind of excitement that comes from visiting a new town or moving into a new place: I might have a sense of what's in store, but there are a host of quirks and unexpected surprises waiting to to be discovered. Some of these quirks will eventually turn into annoyances as the honeymoon phase wears off, but my long dry spell has only augmented the thrill I get from those first few hours of exploring a new game. I recently got my hands on a DS Lite and have been playing through both The Legend of Zelda: Phantom Hourglass and Spirit Tracks. Unsurprisingly, I enjoy both games quite a bit. As I wrote a couple weeks ago, playing a Zelda game is less about being surprised by the kinds of enemies and items I find and more about experiencing a new interpretation of the Zelda mythology. I fully expect to find boomerangs, octoroks, and boss keys, but seeing the way all of the familiar puzzle pieces fit together in a new setting keeps things fresh. Setting sail off of the starting island in Phantom Hourglass and leaving Link's hometown train station in Spirit Tracks recall previous journeys in which the entire world opens up for the impending adventure. Soon, all of the map will be filled in, but for a few hours, the game world is a mysterious place and I am a tourist getting to know the environment. Speaking of mystery, I've also started unravelling a centuries-old tale of intrigue that dates back to the crusades. After many years and two (soon to be three) sequels, I'm finally swan diving into the conveniently-placed hay bale that is the first Assassin's Creed game. While I'm having a bit of fun at the expense of some of the game's contrivances, I've been impressed by the first few hours. Assassin's Creed started off much more slowly than I expected, but I appreciate the care that has been taken to construct the game's sci-fi world. There are plenty of games set in the Middle East, but few of them take place in a quasi-mythical version of the crusades. Even after a handful of repetitive early missions, Assassin's Creed still feels novel, thanks largely to its unique blend of historical mystery and sci-fi genres. Sony's recent "Welcome Back" program for PSN users allowed me to dip into another sci-fi open world game: Infamous. I can't claim that Infamous is a completely new experience for me, as I did play the demo a while back. However, my time with the demo unexpectedly impacted the early hours in the full game. I knew that, unlike in Assassin's Creed, I didn't have to keep a low profile when traversing the city. Smashing things was the order of the day, and I gleefully set about destroying everything I could get my hands on. However, my power trip was short lived, as I soon realized that Cole's powers were actually extremely limited initially. Unlike the demo, I had to earn my upgrades, which made Infamous' drab city far more massive and dangerous than I expected. At a certain point, I ended up reeling it in and playing a bit more defensively by circumventing enemies and learning different paths through the city. 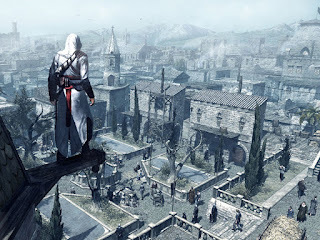 Even now, after several hours, the city still feels like a relatively unknown entity, and the various side-missions and collectibles have kept me from growing too comfortable with the game's main track. Starting all of these games around the same time has reminded me of why some folks jump from game to game. There's something invigorating about a learning a new system and anticipating what a game has in store. Familiarity and repetition can render even the most exciting concepts mundane, but those short opening hours offer the thrill of the unknown. I suppose this is the reason why some people love games like Minecraft: procedural generation ensures that no two worlds will ever be the same. Eventually, I'll chart all of Hyrule and scale every eagle's perch, thereby erasing the anticipatory feeling that comes from piecing together the way a game's world works. I know that learning a game's systems and finishing a long journey through a familiar environment also yields rewards, but for now, I'm still enjoying the novelty of the first few steps. Yay, someone else playing through older games that others have (seemingly) forgotten about. I approve! In all seriousness, though, I envy your ability to experience Assassin's Creed for the first time. While its sequels are undoubtedly better and the initial game was indeed flawed, it was (and still is) a fresh experience that is unlike anything else. To be able to understand that for the first time again is something I will never be able to do, so I am definitely jealous of you there. I've also started InFamous (thanks Sony!) even though I already have enough games on my plate. It's fun and for whatever reason the game always stood out to me as something that I should investigate, but I'd be lying if I didn't say that it hasn't grabbed me yet, either. I don't know, it just seems like a game to dabble in at the moment rather than focus on, and I'm not sure how I feel about that. Thanks for stopping by, as always! I've been thinking what you said about dabbling. I usually think of multiplayer games in that context, but you're right: maybe steamrolling your way to the end just isn't the best way to play some games. Something to think about, especially with all these open-world games these days. It might sound a little strange given how dedicated I am to them, but I view my racing games as titles to dabble in, believe it or not. Games like Test Drive Unlimited 2 and even F1 2010 (despite my story) are great to just pick up and play every now and then, when no other game takes your fancy but you're still in the mood to engage something. Since a title like TDU2 could be considered a secondary lifestyle, of sorts (like the RDR's and Minecraft's of the world), I guess that's not too surprising.